Born from more than 30 years experience of producing highly reliable fetal heart monitoring equipment, the new Sonicaid FM800 is the most exciting new arrival in obstetrics for years. The FM800 is like no other fetal monitor, intuitive design means FM800 is simple to learn and to use, while its unique styling creates a suitable non-threatening atmosphere for mothers-to-be. The Sonicaid Team range is designed for simplicity in fetal monitoring. Developed in collaboration with leading obstetric specialists, the small, easy to use and lightweight unit can be transported effortlessly within hospitals, to clinics, doctors offices or even to the home. 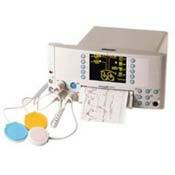 Special models for Antepartum singleton, twins and distance monitoring, as well as basic Intrapartum monitoring. Analysis options for accurate and impartial representation of fetal movements and objective analysis of fetal heart rate.